This story is part two in a series taking a look at daily life on SPCA Certified farms (read part one). Julaine Treur of Creekside Dairy writes about her family’s love of spring and the rhythms of farm life. 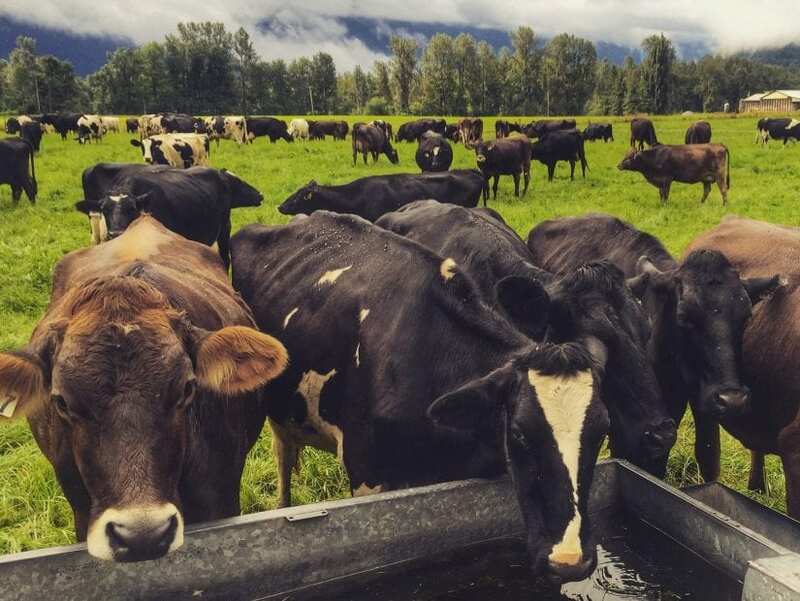 Their dairy farm lies in the eastern reaches of the Fraser Valley. If you want to buy organic, SPCA Certified milk, look for Happy Planet Creamery grass-fed milk in stores near you. Springtime! The time of year eagerly anticipated throughout the cold and dreary winter months on our family farm. After the busyness of summer and fall, our family appreciates the slower-paced winter days. But come January, we start making preparations for the new growing season. We’re out repairing fences, planning the next year’s crops, completing the paperwork for our organic and SPCA inspections, ordering seed and tending to our composting manure piles. Gradually the days grow longer and warmer, allowing our farm kids more time to spend roaming the barns after school. They love interacting with their favourite cows and calves. These future farmers often occupy buddy seats in the closed-cab tractors during early field work, and their small boots often walk beside our own during the afternoon milking shift. The arrival of spring also heralds that most wonderful day of the year: the first day our cows head out to pasture. During the wet and soggy winter, our cows spend most of their time indoors. Our warm and sheltering barns provide a safe and healthy environment during the months of inclement weather. Cold rains and icy winds definitely are not a dairy cow’s ideal habitat. Save for some time outdoors during sporadic sunny and dry days, our cows spend their time relaxing in their comfortable stalls, socializing with their herd mates, wandering the barns, munching at the feed bunk, or enjoying a back scratch at the automated cow brush. Still, as comfortable as the barns may be, we eagerly anticipate sending our cows out the barn door to spend their days in the sunshine and fresh air. As the grass grows tall, we know the day is soon approaching. When it finally arrives, usually in mid-April, we open the gates and enjoy the sight of our “girls” galloping happily out of the barn door to kick up their heels and cavort in the lush grass. It’s such a beautiful experience – the joy they display is delightful, endearing, and incredibly infectious. Our cows spend the majority of each day outside from April to October. It’s a sight that is becoming more rare and unfamiliar, especially here in the Fraser Valley, which is incredibly unfortunate. Besides being picturesque, pasturing also comes with many health benefits for the cows. They see improved hoof and leg health, better mobility and limberness, and cleaner bodies and udders. Plus it’s their natural environment, cows are born to graze! Nothing compares to sitting on the ground in the middle of a herd of cows listening to their rhythmic rip, chew, and swallow as they mow down their daily allotment of grass. Pasturing cows is more labour-intensive than just laying out feed in the barns for the herd to eat. Each day, we move fences and water troughs to provide a new section of fresh grass. The old section is chain harrowed to ruffle up the cow patties, which are a breeding ground for pesky flies. Fly control can also be tricky on an organic farm. We spray our cows with an essential oil mixture at milking time to make them seem less palatable to those thirsty bloodsuckers. Regardless of the extra time and effort required, we feel that giving our cows a more natural lifestyle is the right thing to do. And it’s quite clear to us that our cows approve wholeheartedly of this arrangement: our herd is healthy, long lived, and produces high quality milk. What more could a farmer want? Remember, if you want to buy organic, SPCA Certified milk, look for Happy Planet Creamery grass-fed milk in stores near you. Stay tuned for the next installment in our series of farm stories by signing up for the FarmSense newsletter.